Given the opportunity to condemn infanticide, O'Rourke conflates abortion with infanticide and ends up defending both. 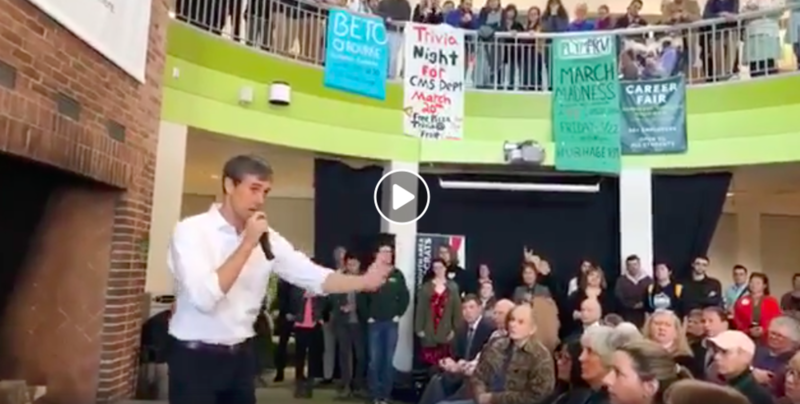 According to Beto O'Rourke, newborn infants are part of their mothers' bodies. According to this logic, after the doctor cut the umbilical cord and handed Beto his newborn child, Beto must have turned to his wife and said, "I've never held such a cute part of your body before!" Additionally, if and when O'Rourke ever spanked, swatted, or flicked his children in discipline, his wife must have joined her children in saying "OW!" Now, does O'Rourke actually believe that a newborn baby is part of the mother's body? No. He is simply parroting pro-choice talking points to evade the question and position himself as a great defender of women's rights. Putting aside the fact that supporting abortion is incompatible with defending women's rights, O'Rourke's answer should not surprise us, though it should certainly disturb us. The pro-choice worldview and the beliefs of individual pro-choice people have always been inconsistent, until recently. The basic pro-choice worldview says that abortion is a fundamental women's right because only women have the right to make decisions impacting their body and regarding their reproduction. Abortion, then, is a procedure that removes a pregnancy, the form of which is not a person with human rights. Basically, the pro-choice worldview says the rights of the mother ALWAYS trump the right to life of the thing in the womb. As the pro-choice worldview has never specified when that "pregnancy" receives human rights, abortion has always been defended and even celebrated up to the day of birth. While unable to explain what magic happens in the birth canal, pro-choice politicians have always held that the birth canal confers personhood. The 2002 Born-Alive Infants Protection Act (which gained unanimous consent from Republican and Democrat senators) is proof of this. This bill specified that babies who survive abortions and are born are to be recognized as human beings with human rights. However, the bill did not define what types of care, if any, are to be rendered, and did not assign legal penalties to abortionists who killed infants who survived abortions; hence the 2019 proposed Born-Alive Abortion Survivors Protection Act. The inconsistency between that worldview and the positions and beliefs of individual pro-choice advocates was made strikingly clear over two decades ago when both Bill and Hillary Clinton said abortion should be "safe, legal, and rare." The immediate question from the pro-life community was "Why rare?" If pro-choice advocates believed in the pro-choice worldview, it would make no sense to want abortions to be rare. If the thing in the mother's womb is not a person with human rights, then abortions are no more morally significant than clipping your toe nails. And if abortion clinics can get rich off of performing morally insignificant abortions, then pro-choice advocates ought to be saying, "Keep abortion safe, legal, and frequent!" However, for decades, pro-choice individuals were uncomfortable with more abortions and liked the idea of abortion being rare. Why? Deep down, though they wouldn't admit it, they all knew that abortion killed a baby without proper justification. A 2018 Gallup Poll shows that Americans become less and less comfortable with abortion the more developed the baby is, with public support dropping from 60% in the first trimester to 13% in the third trimester. If only 13% of Americans agree with Beto O'Rourke's support of third trimester abortions, how many do you think agree with him inferring that a newborn baby is part of the mother's body and that we ought to "trust women to make their own decisions" regarding infanticide. I'd wager less than 1%. While we should all be grateful for the decades of intellectual inconsistency between the pro-choice worldview and the individual opinions of pro-choice legislators, it was only a matter of time before they wised up and became more consistent. That consistency should disturb us all. Since magic can't explain the conferring of personhood as the baby passes through the birth canal, many pro-choice legislators have not only sought (with some having been successful) to legalize abortion in their state to the day of birth, but have also fought tooth and nail against the Born-Alive Abortion Survivors Protection Act, sponsored by Senator Ben Sasse [R-NE]. The rationale here is simple. If the unborn is not a human person and ending the unborn's life at any stage of pregnancy is a fundamental woman's right, then why should that mother's "right" cease simply because 1 minute and 6 inches has passed from when the baby's head stops being "unborn" to when the rest of the body follows seconds later? As disturbing as opposing an anti-infanticide bill is, the opinions of people like Beto O'Rourke and the 44 Senators who shot down Sasse's bill are completely intellectually consistent opinions. However, consistency can be dangerous. When you ground human value in accidental properties such as size, level of development, environment, dependency, cognitive ability, self-awareness, etc... you don't just dehumanize unborn people, you dehumanize born people as well because none of us share those properties equally. Sadly, Beto O'Rourke is just a microcosm of the Democratic party and of the 2020 Democratic field. Keeping abortion "rare" is long gone and befriending Moloch in welcoming infanticide with open arms is the new norm. Seth travels and speaks in Protestant and Catholic high schools, churches, training seminars, and for pregnancy resource center banquets, engages in academic debate, and blogs and writes as a cultural and political commentator. Seth has been published by Christian Research Journal and writes regularly for Life Training Institute and his own blog.